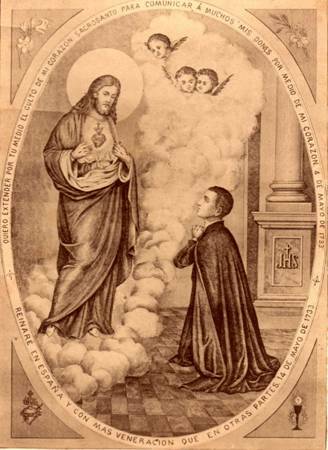 Earlier this year, I discovered a new friend in heaven – the Blessed Bernardo Francisco de Hoyos (1711-1735), a Jesuit mystic of the Sacred Heart. Today is his feast. I like Blessed Bernardo for a lot of reasons. I admit, it’s hard to get a great sense of his life story, as so many of the materials about him (or by him) are untranslated from their original Spanish. Nevertheless, a few things are clear. We share a devotion to the Heart of Jesus. 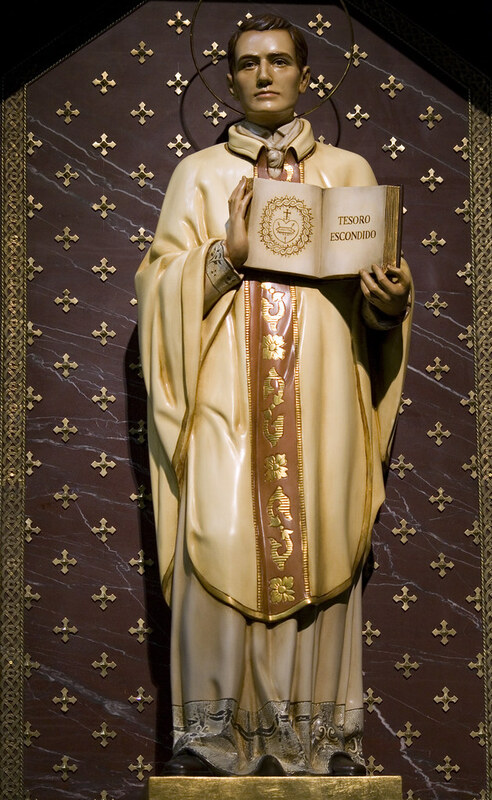 Blessed Bernardo received private revelations of Jesus in which he was shown the Sacred Heart, culminating in a monumental mystical union. While strange phenomena are by no means unheard-of in the lives of the saints, Bernardo’s story is unusual insofar as many of his experiences were more typical of female mystics. The Sacred Heart devotion itself was often seen (and ridiculed by Jansenists) as an effeminate innovation that oozed sentimentalism. It’s hard to square that view with the very real rigor of Blessed Bernardo’s Jesuit life. As usual, simple narratives tend to fail when placed against a far more interesting reality. The Spanish priest died when he was only 24. I will be 24 in a little over a month. It’s hard to imagine coming to the same heights of sanctity and intimacy with Jesus in such a short time. I look at my own spiritual life – scattered with sins and shortcomings, easily worn out, so often caught in a kind of lax scrupulosity – and I wonder how Bernardo did it. Of course, it does rather help if you enter a Jesuit novitiate at the age of 14, as Bernardo did. That’s a good ten years of arduous ascetic labor and practice at prayer. All the same, lots of men entered religious life as youths in the early modern era. Not all of them achieved mystical marriage, one of the highest states of the interior life. And that even with many decades in the habit. It occurs to me that, at the recent Vatican Youth Synod, stories like the Blessed Bernardo’s were mostly absent. The challenge of sanctity – indeed, its romance and adventure – were tepidly drawn at best. The tone of the discussions and of the later summary document may have been interpreted by some as a compassionate, realistic, and open-minded approach to the realities of life in the 21st century. But surely there was more than a touch of Dostoevsky’s Grand Inquisitor about the whole thing. You know the style. Holiness really is too hard, so we should make things easier – allow them to reach some other goal, some lesser goodness that isn’t holiness at all. The experience of all the saints, but especially mystics like Father Bernardo Francisco de Hoyos, runs counter to this maudlin spirituality. The truth is much more dangerous, and much more exhilarating. Holiness demands heroic virtue. We are called to be heroes. But true heroism looks very different than what this world – or what a worldly hierarchy – thinks it is. It is a life of risk and sacrifice and no small discomfort. But the rewards it gives are beyond all telling. Blessed Bernardo knew that. He knew that the only true recompense that the Christian will receive is Christ Himself. And so he went unflaggingly forward to the work he was given as a missionary of the Sacred Heart. His entire life was a brief, bright blaze of love for Jesus. In this, he rather resembles that other great devotionalist, Fr. Faber, who died at the age of 49, a full 27 years before Cardinal Newman. Souls like these are gifts to the whole Church. They kindle the love of God in their fellows and light the path to His holy mount. But they also present us with a challenge. By incarnating the charity of God in such a visible way, they invite us to the same labors of love. All of us are called to gaze upon the Sacred Heart. Holiness is not an adventure closed to any of us, no matter how young (or old) we may be. 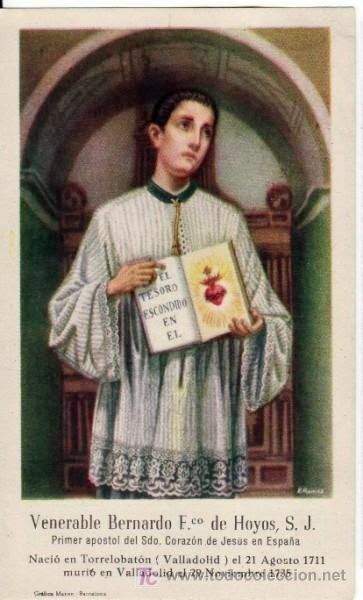 If there is anything we can take from the story of Blessed Bernardo Francisco de Hoyos, priest, missionary, and mystic, it is this salutary truth.